Jatin Bhatia is a young, vibrant 30 years old IT professional who lives in New Delhi and is in pink of his health. He works with a reputed company which provides him with a comprehensive health cover. Hence, investing in a personal health insurance in India is the last thing to cross Jatin's mind. There are thousands of young working professionals like Jatin in India that consider health insurance plans are designed for elderly people as they are more likely to fall sick. This is where the young guns fire wrong. The reason for opting for health insurance is not just about being financially protected during sickness and hospitalization but also to stay prepared beforehand with wide-ranging coverage and multitude of benefits. There are umpteen reasons why medical insurance at an early age is a sensible decision. Let's take a look at the most obvious ones. The premium of these policies differ from one insurer to another and the age of the policy seeker plays an instrumental role in working out the premium. As an individual ages, his or her health related risks also increases. Health insurance companies in India impose higher premium for people with higher risks. Hence, the premium increases as the individual's age also advances. All the above mentioned premium are worked out for Sum Insured of Rs. 3 Lakh. The table clearly shows that the premium increases as the individual's age advances and the premium increases rapidly once the the age of the individual goes past 40 years of age. If you compare lowest health insurance premium available for different age-groups you can realize that your best bet getting the cheapest health insurance in India lies is to secure one when you are young and healthy. Most health insurance plans in India come with a 2 - 4 years of waiting periods for pre-existing diseases and various specified benefits such as maternity benefits, child birth coverage. Aside from that, many health insurers also cover certain diseases and treatments such as surgeries after specified period of time. Buying health insurance early is advantageous as you will play the waiting game when you don't require your health cover. In contrast, if you try to buy a health cover after 60 or even after 45 years of age, you will have to put up with not only longer waiting periods but also many exclusions as well. Fast life coupled with lack of physical exercise, unhealthy food habits, job related stress and anxiety has been triggering a lot of lifestyle as well as life-threatening diseases of late. Dengue and other Vector-borne diseases are widespread as well. Hence, there is not much to choose between young and older generation when it comes to fall prey to ailments. This is why, availing a health insurance early does make sense. 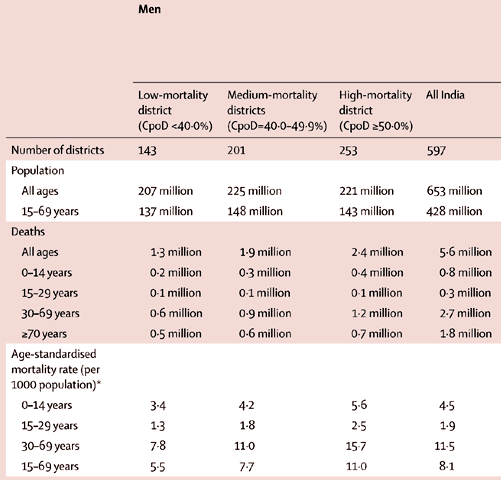 This table is the outcome of a survey conducted among 0·27 million adult deaths (men) at an age of 15–69 years in 597 districts across India. The data clearly shows that the 30-69 age-group is the most vulnerable one when it comes to mortality rate. New-age health insurance plans are not limited in providing coverage during, before and after hospitalization but also providers protection against OPD, day care procedures. So, apart from serious ailments, even if you visit doctor for minor issues, your expenses will be covered. Most young individuals spend on trivial health hazards and an early enrollment in health insurance in India will keep their out-of-pocket medical expenses in check. It just takes a few minutes to compare health insurance plan online and trace out the policy with maximum benefits. In India, it is extremely difficult to get health insurance with a medical history. A person diagnosed with cancer or heart disease would either be rejected by insurer or has to pay high co-pay at the time of a claim. The risk pertaining to young people with sound health is less and this is why they are least likely to be denied of a mediclaim insurance in India. After 40 years of age, most health insurance plans come with co-pay which is a burden for policyholders at the time of a claim. Hence, it is prudent to avail health insurance between 30 and 40 years of age when majority of the health covers don't thrust any co-pay upon policyholders. It is not prudent to depend solely on the medical cover provided by the employers. Most group health policies come with insufficient coverage and if you are not armed with any other protection, you might be in trouble in time of an emergency. Furthermore, corporate medical plans will cease to have effect once you switch company and you never know what type of medical coverage ( if at all) you will get from your next employer. So, it is prudent to get a health insurance with enough coverage that you can make use of throughout your life. Since, most health insurance companies in India accept proposals from young individuals, one can choose the best health insurance in India from wider range of available plans. The chance of getting health plans with lifetime renewal is also high during young age. After 40 years of age, the number of available options significantly decreases. After 50 years of age it further decreases. So, is is sensible to choose from wider range of options when one is young and around 30 years old. Most health insurance companies in India reward policyholders with bonus on Sum Insured for not making any claim. If you get health insurance early and renew your plan every year without making any claim you can accumulate higher bonus on your Sum Insured. You can reap this reward when you will grow old and starts suffering from various conditions. Health insurance premium that policyholders pay from their income is eligible for tax deduction. By buying health insurance at a young age you can enjoy tax benefits for a longer period of time. Young working individuals usually have a long wishlist which includes buying a car, a flat or a two-wheeler. Inclusion of a personal health insurance plan with good coverage in the list would do them a world of good. Buying health insurance has become lot easier too. Internet savvy generation can effortlessly compare health insurance online and buy the best health insurance in India as per their requirements on GIBL.IN, the premiere online insurance marketplace in India.